So now he loves the stuff, as he should, and talks about and asks for pineapple upside down cake often. Mission: Accomplished. His birthday was celebrated not too long ago (wheeeee!) and I wanted to bake him something super yummy. When I asked him what types of things he would like, he responded with "a cinnamon roll cake and/or pineapple upside down cake". Thus this thing was made (because honestly, I can only eat cinnamon roll cakes so many years in a row...going on 5 now). Ha! I decided to whip out my Southern Cakes cookbook, by Nancie McDermott and try her truly southern version. We were NOT disappointed. I doubled the recipe, so I could make two cakes and each came out delicious as ever. Because the cake sits in a pineapply caramel, the cake batter is on the stiff side. It was a bit too stiff for my liking, so I added a tiny bit more milk. The outcome was amazing- caramelized pineapples which top a perfect vanilla cake. Then the brown sugar and butter create the most delicious pineapple-y caramel, which soaks into the cake and drips down the sides. Yes. Please. 1. Preheat the oven to 350°F and get out your 9" cake pan. Using the butter wrapper, lightly grease the side of your pan. Set aside. 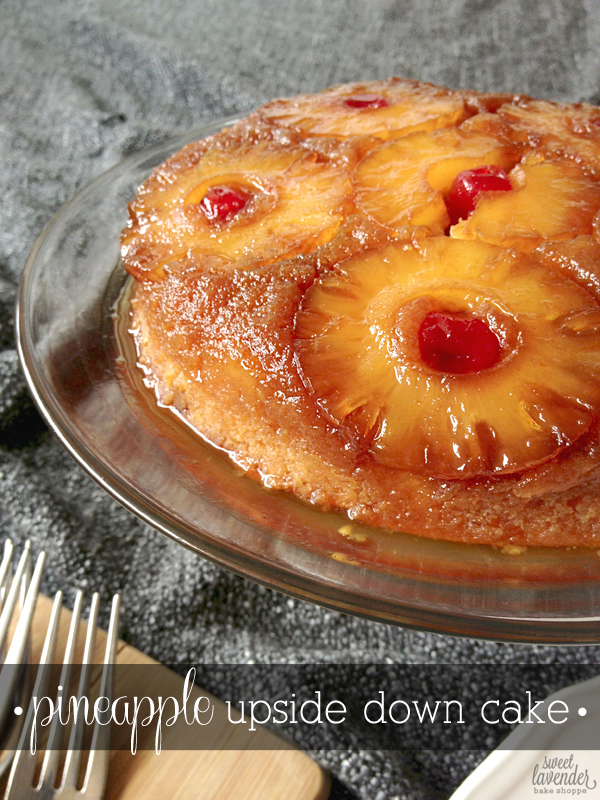 Also, drain the pineapple rings well and reserve 2 tablespoons of the syrup for your cake batter. Set aside. 2. In a small sauce pot add your first 4 tablespoon butter measurement. Melt over medium-low heat until just melted. I opted to go a little further and brown it slightly- delicious! Pour melted butter into the bottom of your lightly greased cake pan. Next, sprinkle your brown sugar over the butter. 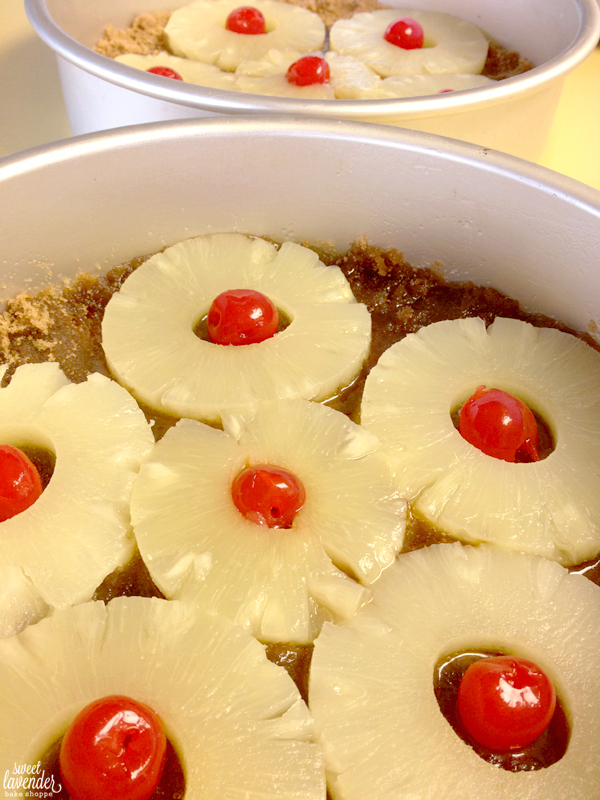 Finally, place the pineapple rings onto the brown sugar/buttered bottom and arrange so that it is one nice even layer. Add one maraschino cherry to the middle of each ring and set pan aside. 3. Into the bowl of your stand mixer, add your flour, vanilla sugar, baking powder and salt. With a paddle attachment, mix on low to combine. 4. In another bowl or large measuring cup, mix together your milk, reserved pineapple syrup, and vanilla extract. Add the milk mixture and your butter to the flour mixture and beat on medium-low speed until combined. Stop and scrape down sides and bottom of bowl and beat another 1-2 minutes on medium (or until smooth). Again, the original recipe called for 1/2 cup of milk...but to me this made the batter WAY too stiff- even after the egg was added. So I opted to add another 1/4 cup of whole milk which made a batter I was much happier with and a totally yummy and wonderful end product. 5. Finally, add your egg and beat for another 1-2 minutes, making sure to stop and scrape sides and bottom of bowl once more. 6. Carefully pour cake batter into your prepared cake pan, making sure to spread evenly over the pineapple and cherries (but not disrupting them too much). Pat pans on counter a few times to settle the batter even further. 7. Bake at 350°F for 35-40 minutes or until the cake is golden brown along the sides, middle springs back when gently pressed, and a toothpick inserted into the middle (but not through to the very bottom) comes out clean. Cool cake for 5 minutes in pan and then carefully (with oven mitts) turn out onto a cake platter or plate. I did this by flipping my cake stand upside down, placing over the top of the cake and then carefully pressing the two together- flipping the bottom of the cake pan over, so it's now the new top. Then, gently remove the cake pan- your pineapples and cherries should be beautifully displayed on the top of your cake, with syrup dripping down. MmmMmm! Serve warm with vanilla ice cream or whipped cream or cool to room temperature! 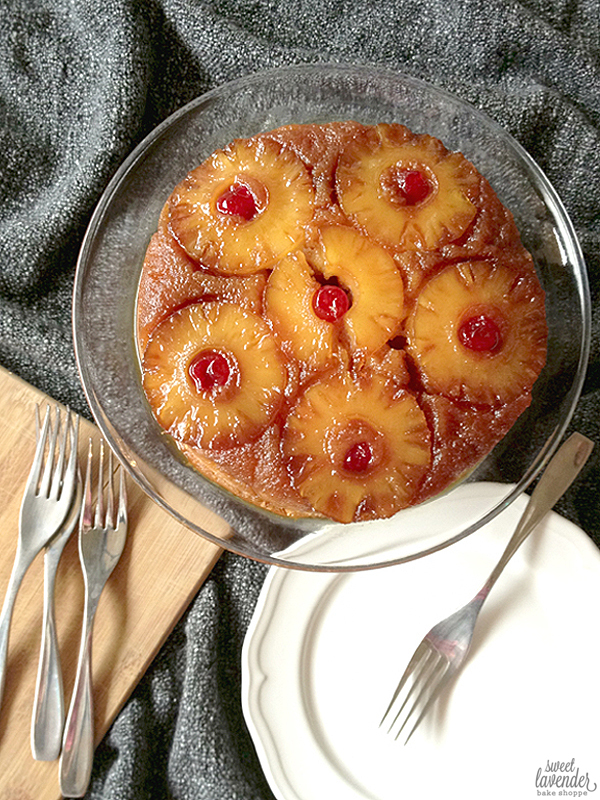 What is it about husband's and pineapple upside down cake? It's funny every man I know either loves that or german chocolate cake. That's funny! I didn't know that was a thing! My husband is NOT a German Choc fan, but he sure can put down a Pineapple Upside Down Cake! Hahaha. Aww that's so fun! Aren't they just the best things?!?!!? So glad you enjoyed!